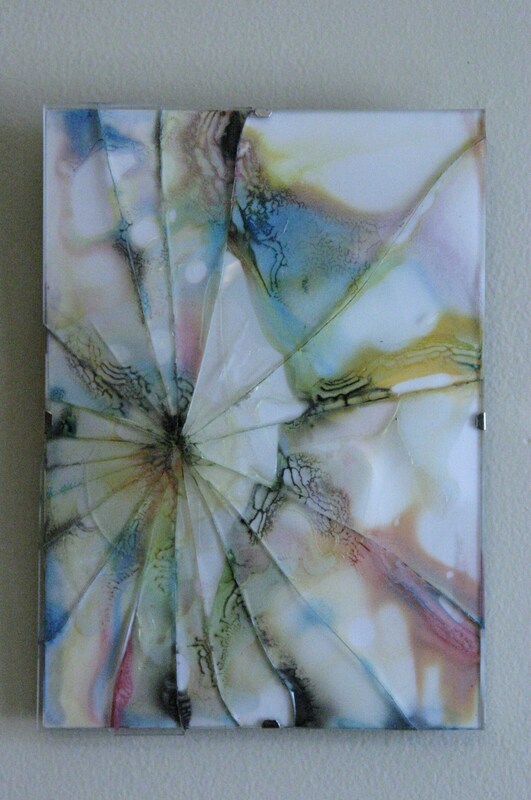 This is a series of paintings I did by breaking glass and dropping paint in the crevices. 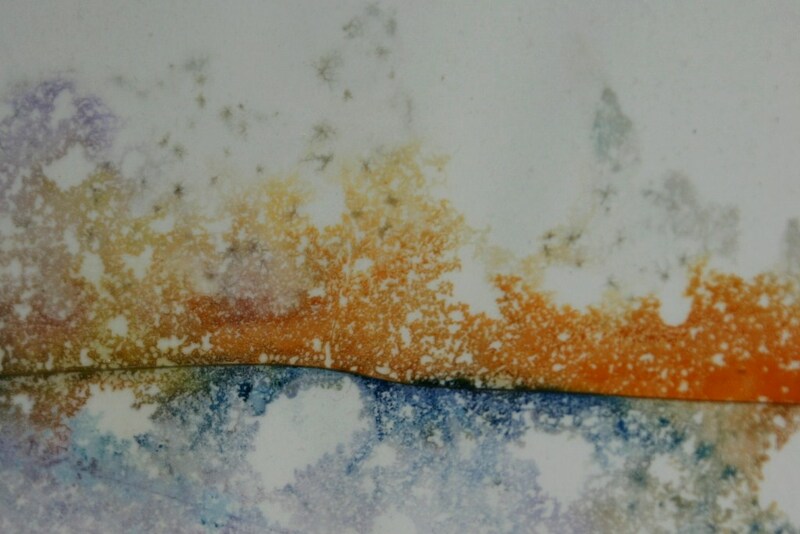 Sunrise was created with watercolor on Yupo paper and sealed with Galkyd epoxy. 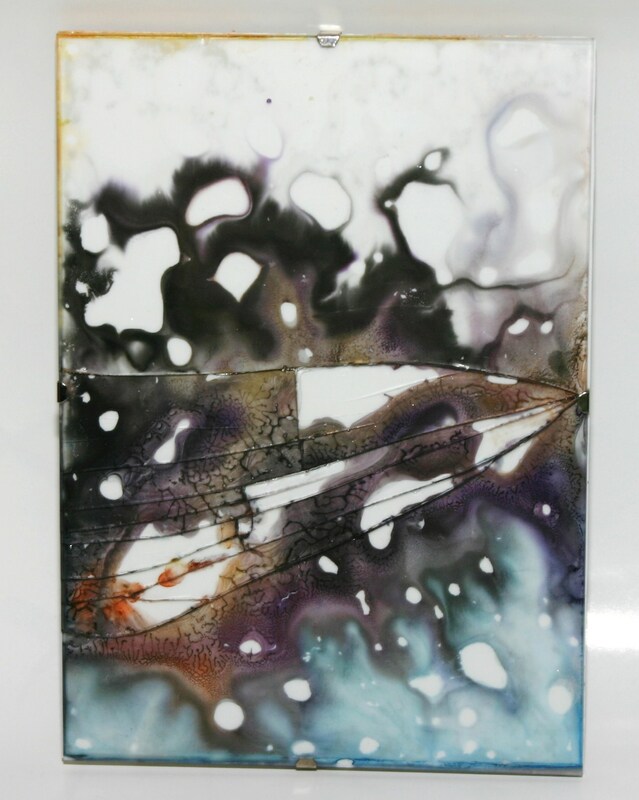 I prefer Yupo for the interesting ways the paint doesn’t cling to the paper as it dries, preferring instead to stick to the glass. 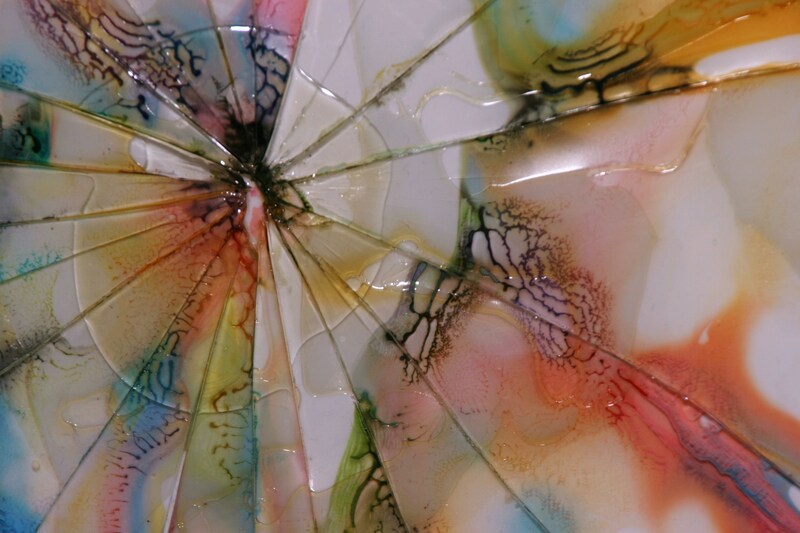 If the fragments of glass were lifted off the paper, the delicate lines of pigments that have formed between the paper and the glass would break, and the result would be lost. This is why it’s important for the painting to be sealed or stabilized in such a way that the glass doesn’t move once the work is done. 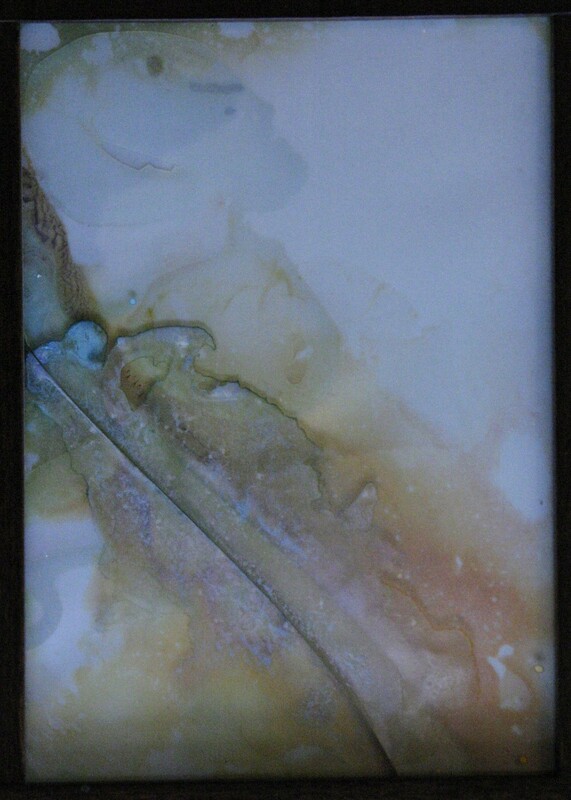 Watercolor and metallic pigments, sealed with glass with Galkyd on Yupo paper. 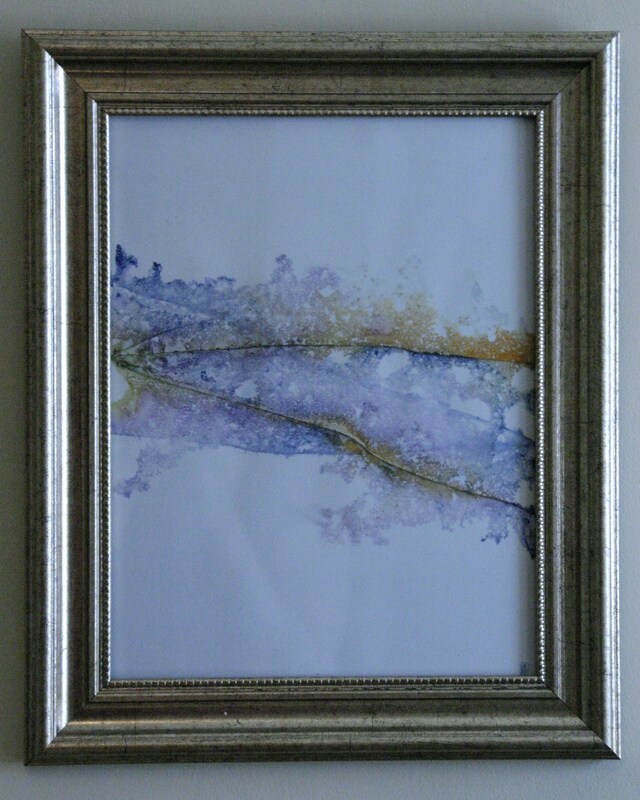 Ursula Swirl was created using the same sort of tension frame that Sunrise makes use of. 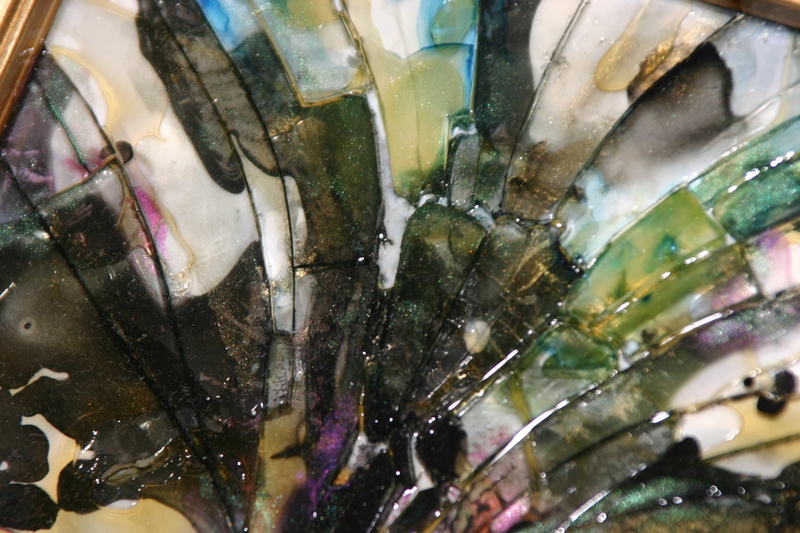 One major difference is that the glass on Sunrise shattered more than with Ursula Swirl, so while I had to seal the former together with epoxy, Ursula Swirl is held together by the original tension mechanism. 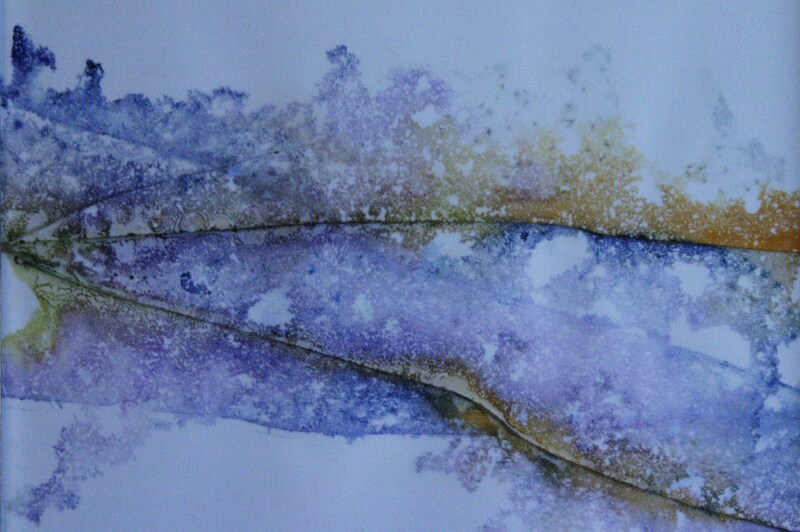 Ink and watercolor on Yupo paper. 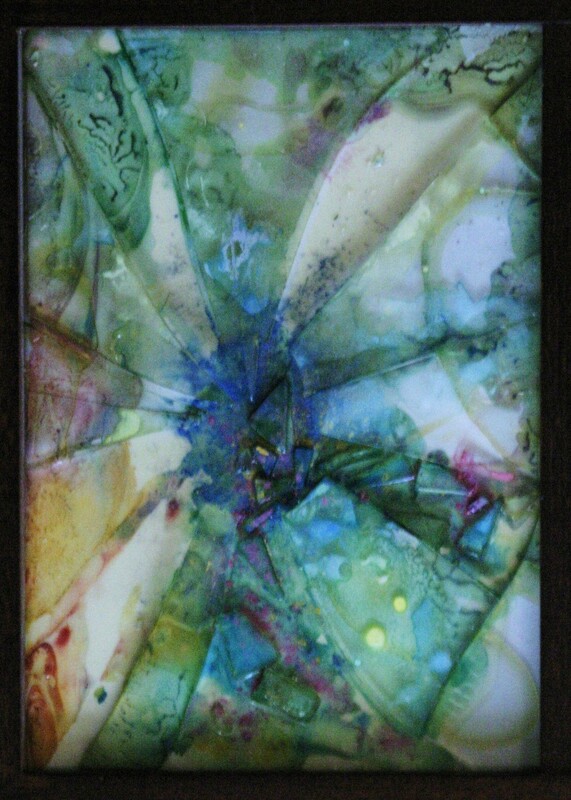 This is the one that started the process of broken glass painting for me. 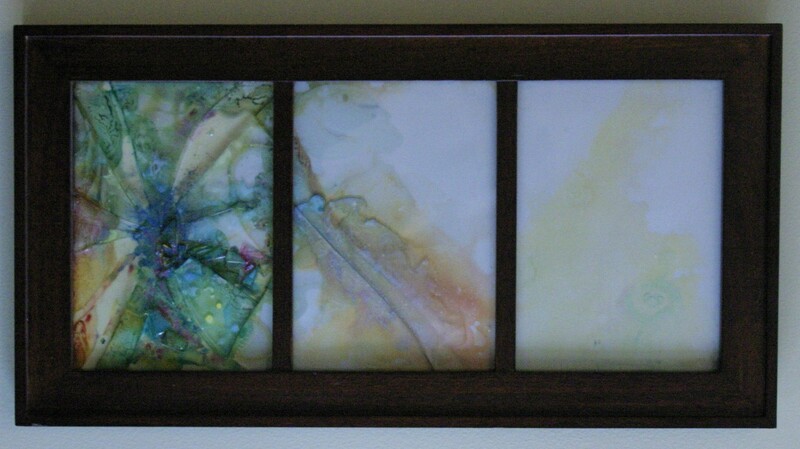 I had taken whatever picture that was in this frame out, and then the pane of glass so I could clean both sides. Something distracted me and I set the glass down on the rug. When I came back into the room – SNAP – I stepped right on the middle of it and broke it clean in half. I know glass can be recycled, but I just hate throwing stuff away. 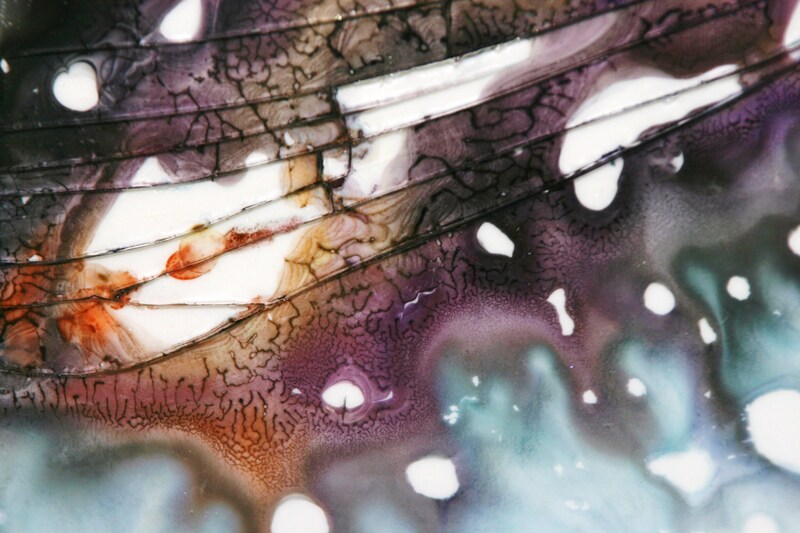 I thought, Hey, why not?, slid a piece of Yupo paper underneath the glass, and set off to find my paints. Fire Tsunami is the result. 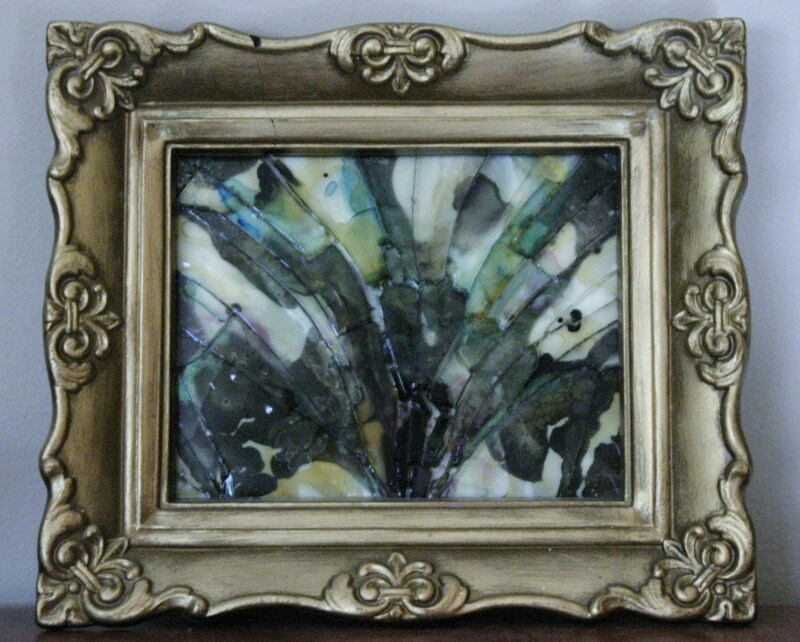 When I found this frame at the thrift store, I knew it would be great for a broken glass work. But the smaller frame made the glass harder to break, and I cracked the plastic gold frame when the glass finally gave way. Sealing this tiny painting (4X6″) together with epoxy proved tricky with all the cracks, but in the end, Rorschach 101 turned out fabulous. 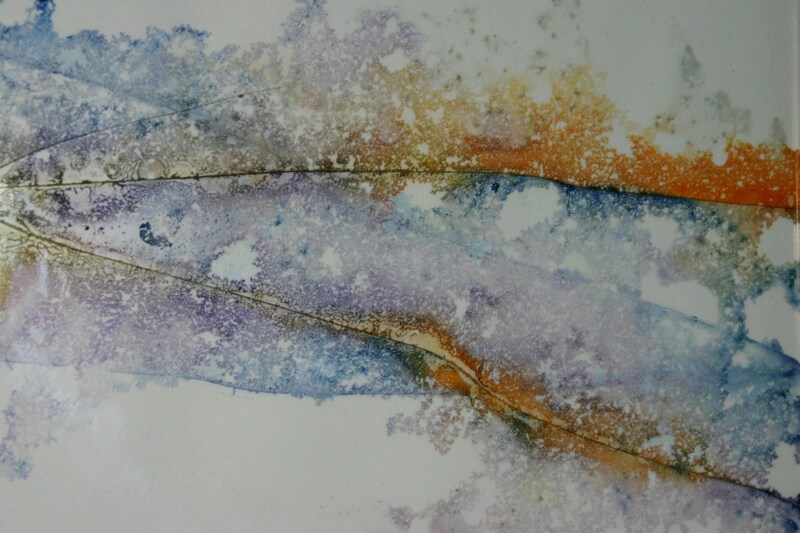 Ink and watercolor with metallic pigments on watercolor paper.